Sukhoi PAK FA T-50 ‘Raptorsky’ Going into Production as Sukhoi Su-57 5th-Gen Multi-Role Low-Observable/Stealth Fighter Jet Manned/UAS/UAV/Drone Aircraft! | DefenseReview.com (DR): An online tactical technology and military defense technology magazine with particular focus on the latest and greatest tactical firearms news (tactical gun news), tactical gear news and tactical shooting news. 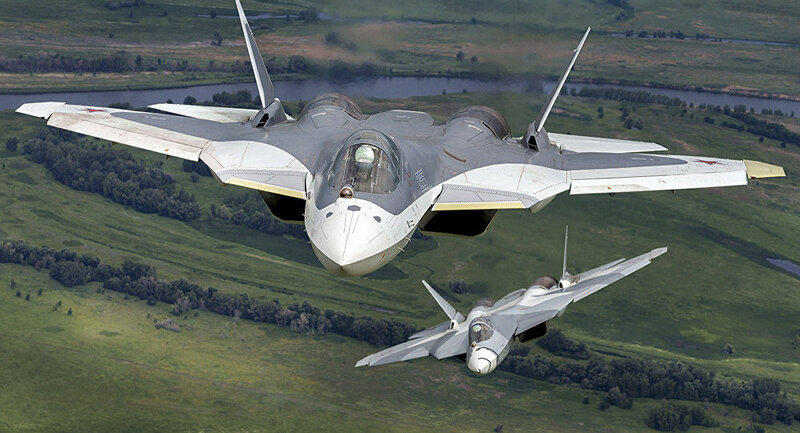 Sukhoi PAK FA T-50 ‘Raptorsky’ Going into Production as Sukhoi Su-57 5th-Gen Multi-Role Low-Observable/Stealth Fighter Jet Manned/UAS/UAV/Drone Aircraft! Each such plane [Sukhoi Su-57] becomes a computer center which is able to decide exactly what type of arms and ammo it needs for a specific combat mission. In the UAV mode, the plane can reach its target much faster with overloads of up to 15 G, while the maximum overload a pilot can endure does not exceed 10 G.
Just great. As if we didn’t have big enough problems with developmental Russian fighter aircraft tech already. 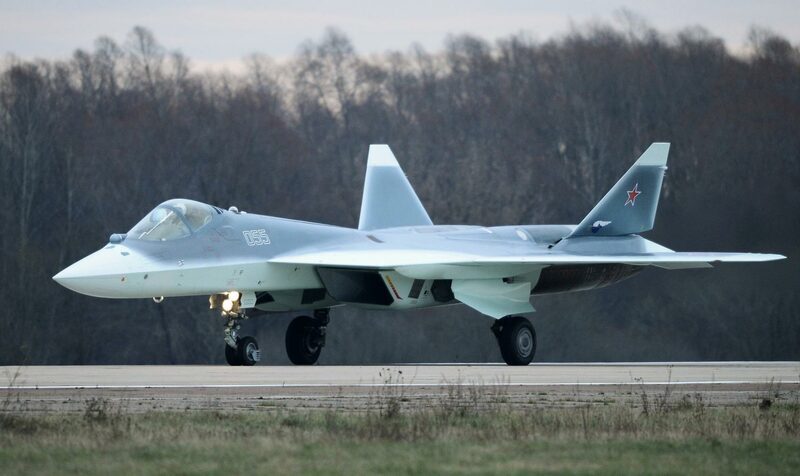 According to Pryadka, the Su-57 stealth fighter will be able to “act autonomously analyzing the situation inside the combat zone where making quick decisions is vital.” In other words, Su-57 will employ AI (Artificial Intelligence). It will also be remote-controllable by Russian drone pilots sitting in a bunker somewhere. Like the Lockheed Martin F-22 Raptor, the Su-57 utilizes a twin-engine design and thrust vectoring, albeit with less-stealthy round thrust-vectoring nozzles rather than square nozzles. It would seem logical that the Su-57 utilizes Sukhoi’s full-aspect thrust vectoring system, rather than the F-22’s limited thrust vectoring–although there are some experienced fighter pilots out there who contest the combat advantage that thrust vectoring provides, even in a WVR (Within Visual Range) air-to-air combat engagement. However, DR is more concerned about the Su-57’s BVR (Beyond Visual Range) capability. 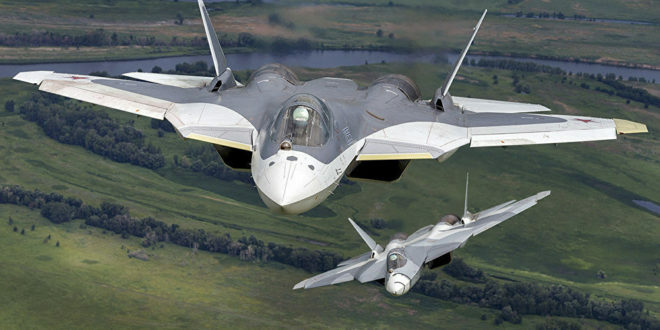 The aircraft will carry the K-77M missile (we don’t know how many, yet), which give the Su-57 a reported 125-mile engagement envelope versus the F-22’s 100-mile engagement envelope with the AIM-120D Scorpion. This situation is emblematic of why Defense Review has been arguing for the US Air Force to adopt a ramjet long-range air-to-air missile like the MBDA METEOR ramjet Beyond Visual Range Air-to-Air Missile system (BVRAAM). The goal should always be to be able to effectively detect and destroy the enemy at BVR range using superior radar and missiles. WVR engagements should be seen as an absolute last resort, even though they’re much for fun and interesting for pilots, the most interesting and fun being gun (cannon) kills, of course. Anyway, assuming it works as advertised, the Su-57 has the potential to give the US Air Force some serious air-superiority headaches in proxy wars like Syria, let alone real World War III (WWIII) complete or semi-complete (conventional/non-nuclear) nation-state warfare scenarios, particularly if they’re also (eventually) armed with laser-weapons (including air-to-air and air-to-ground laser cannon systems), radio-photonic radar systems, microwave weapons and electronic munitions. That could prove really problematic for us, particularly if we can’t match them. Army Research Lab (ARL) developing Hardened Automonomous, Artificially-Intelligent (AI) Distributed Robot Swarms (or, Swarm Bots) for Future Electronic Warfare Environments: Will They be Ready and Capable for World War III (WWIII)? Will the Russian Air Force Beat the US Air Force to the Punch with 6th-Gen Jet Fighter Aircraft-Mounted Laser Weapons, Radio-Photonic Radar (‘Radio Vision’), Microwave Weapons and Guided Electronic Munitions? Let’s Hope Not. Chinese Chengdu J-20 Low-Observable/Stealth Jet Fighter Aircraft: How Big a Threat is It? Chinese Military Developing ‘Invisibility Cloak’: Multispectral Adaptive Camouflage/Visual Cloaking Technology for Future Chinese Fighter Aircraft and Vehicles and Future Warfare? Russian RS-28 Sarmat Satan 2 ‘Super-Nuke’ and ‘object 4202’ Hypersonic Glide Vehicle (HGV): Russia Getting Ready for for World War III (WWIII)? Lockheed Martin 60-kilowatt (kW) Fiber-Optic Airborne Laser Weapon being Tested within 18 Months for Future Warfare Applications! F-22 Raptor Program Cancellation: Will we learn from it? Eurofighter Typhoon: Can Thrust-Vectoring and Low-Observability be Added? Previous: Heckler & Koch (HK) HK433 ‘Compact and Modular’ 5.56mm NATO Assault Rifle/Carbine/SBR: What’s the Point?